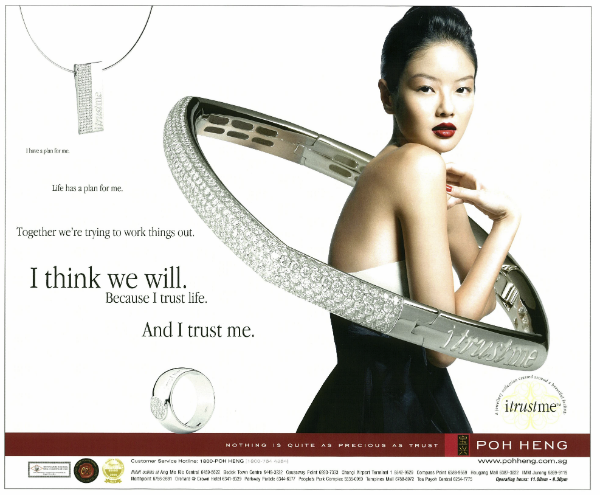 Poh Heng was trying to attract younger consumers, women who are more fashion conscious and upwardly mobile, financially independent. 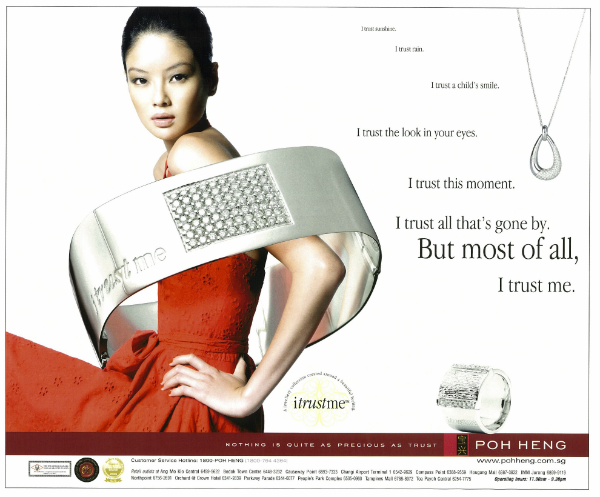 This segment has steadily grown in Singapore and as in the rest of the world, jewellery is viewed differently by them as compared to the generations before. It’s in fact more fashion and luxury really, no longer seen from a mainly investment/value perspective. Part of life, part of style. Must reflect personality. We had been asked to come up with some names for new collections. Our team usually has an art director and a writer working together, and while thinking about the names, we wondered if we could suggest to the client to specially create a range with the words I trust me written on it. A sort of inner thought of today’s woman, young or older, a need in fact to feel that trust in oneself. Discreetly etched on a piece of jewellery it might appeal and make for a successful line. 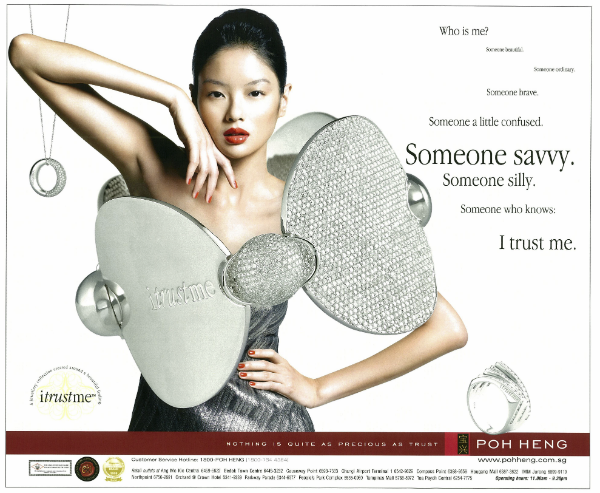 Poh Heng loved the idea. And placed their trust in us, really appreciate that. 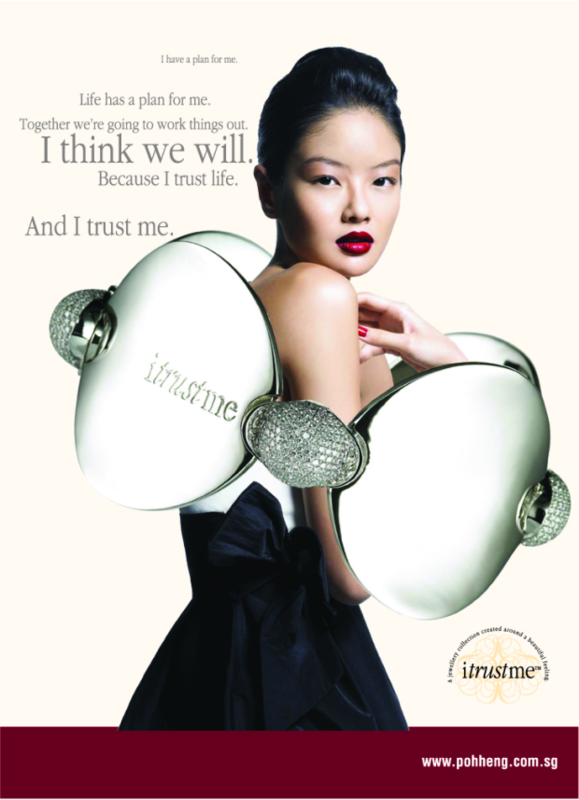 Here are a few ads presenting the I trust me collection. Copy: I have a plan for me. Life has a plan for me. Together we’re trying to work things out. I think we will. Because I trust life. And I trust me. Copy: I trust sunshine. I trust rain. I trust a child’s smile. I trust the look in your eyes. I trust this moment. I trust all that’s gone by. But most of all, I trust me. Copy: Who is me? Someone beautiful. Someone ordinary. Someone brave. Someone a little confused. Someone savvy. Someone silly. Someone who knows: I trust me.